Rubin’s Space To Get New Tenant, What Has That To Do With Brookline 40B? If you have bean meaning to grab some Indian food from Shan-A-Punjab lately on Harvard Street, bad news. It is closed. Good news? 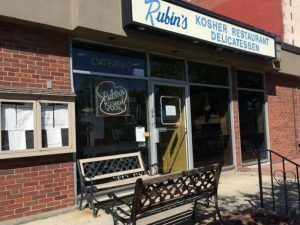 They have found a new home across the street into the space formerly known as Rubin’s Deli. Now, what does that have to do with 40B developments? Both properties 500 Harvard Street where Rubins Deli once operated and 455 Harvard where Punjab has been since 2013, are owned by the Danesh family. 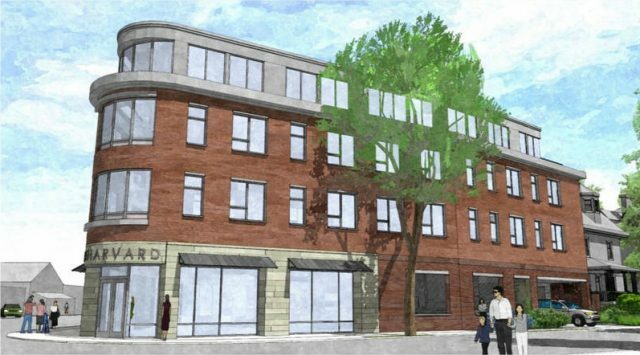 And 455 Harvard is one of more than a dozen in town slated for redevelopment using a Chapter 40B zoning waiver – a state law that allows developers to bypass local zoning if the building they are proposing includes some 25 percent units deemed affordable – to the chagrin of many community members. The Danesh family members are proposing a mixed-use project at the 8,324 sf lot at the corner of Thorndike. The proposal consists of ground floor retail and parking and three floors, 17 rental residential apartments and 10 parking spaces (seven by way of automatic lift). In March, one woman wrote to the town to request a moratorium be placed on any construction on the site for historical reasons. “The building at 455 Harvard Street is a quaint, early gas station–probably used by the Kennedys for their new motorcar–and is threatened by developers who want to demolish it and build a multi-story structure that would not only deprive us of an architecturally and historically significant building from President Kennedy’s childhood years and but also violate the streetscape and degrade the environment of neighbors and the community,” said Brookline resident. Victoria Longino. But, according to the Historical Society’s Ken Liss, that isn’t exactly the case. A 1994 Brookline Preservation report on the building called it “the last intact early 20th century station on Harvard Street,” but it was built in 1935, eight years after the Kennedys left Brookline, he said.